1. For the slaw, cut the mango into matchsticks. Mix with the veg and coriander; chill. Stir the mayo, chipotle and ketchup in a bowl; chill. 2. When you’re ready to eat, put the flour, bicarbonate and salt in a bowl and, using a fork, stir in the beer and 50ml iced water until just mixed (a few lumps are fine; aim for the consistency of double cream). 3. In a deep, heavy-based pan, add enough oil to come 5cm up the side. Place over a medium-high heat until it reaches 180˚C on a sugar thermometer (or a cube of bread turns golden in 30 seconds). Toss the prawns through the batter then, in batches, carefully lower into the hot oil. Cook for about 1 minute, until deep golden, then remove with a slotted spoon and drain on kitchen paper. 4. 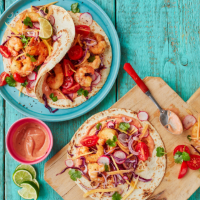 Dollop 1 tbsp chilli mayo in the centre of each tortilla; add the prawns and slaw. Serve with quartered tomatoes and lime wedges, if liked.